Ochre and Red on Red was executed during the artist's mature years in the mid-1950s, when he painted scores of large canvases. His works from this period all have a similar format, but vary widely in mood, depending upon their color and internal proportions. 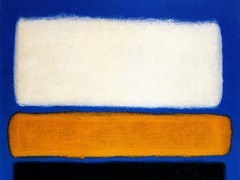 Rothko abhorred being viewed as a formalist abstract artist whose foremost intent was to arrange color fields on a flat canvas; he insisted that his art concerned the distillation of human experience, both tragic and ecstatic, to its purest form. His goal was to abandon any visual obstacles detracting from the c entral idea. Rothko's paintings, heavy with implied content and emotional impact, ventured beyond abstract representation to embody the drama of humanity. Through the purity of his paintings, their effect on the viewer became more direct and incisive. Ochre and Red on Red a buoyant effect is created by the blazing yellow square, which, in comparison to the darker red of its surroundings, appears to surge out of the composition into the viewer's space. Through countless color manipulations executed on a large scale - an approach comparable to that of a composer arranging musical notes - he created powerful, timeless absolutes of human sensation ranging from exultation to torment. 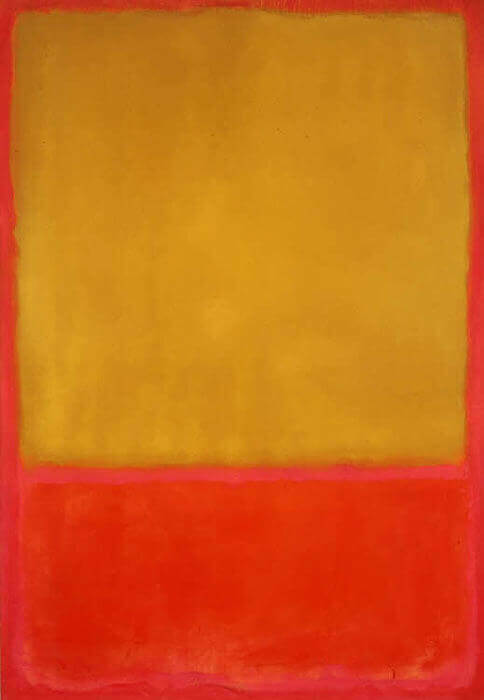 Ochre and Red on Red becomes an example of Rothko's highly emotional works with its high-keyed pigments and vibrant colors. Rothko's mature works, such as Ochre and Red on Red, were often painted on a large scale, enhancing their dramatic effect that allowed viewers to place themselves inside the composition, heightening their personal experience. In order to most effectively communicate his vision to the viewer, Rothko anxiously oversaw the environment in which his paintings were shown. He preferred that they hang separately from the work of other artists in dim lighting, their large dimensions dominating the surrounding space - all in the endeavor to thoroughly immerse the spectator in their power and enhance their mystical essence.